For the AI counterpart, see Slasher. 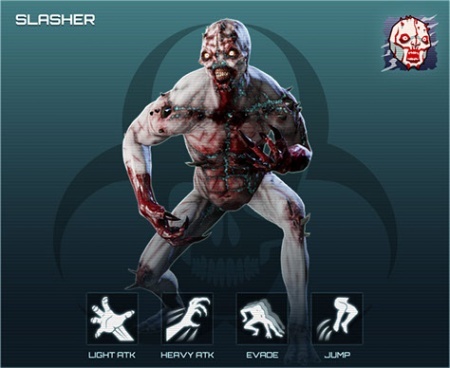 The player-controlled Slasher is one of the playable ZEDs in Killing Floor 2's Versus Mode. The Slasher role's in the ZED team is to distract the Survivor team using his high speed, jumping abilities and evasive maneuvers. The Slasher is also capable of dealing a surprisingly high amount of damage if the players can continuously land their attacks. Due to Game Conductor mechanics, player-controlled Slashers have their health modified based on the average level of the Survivor team. Values vary within (x0.85 - x2) range. Player-controlled Slashers have a wide variety of damage type resistances however they are less resistant to SMG, Slashing, Bludgeon and Fire based damage types. They are also less resistant to damage from certain tier 1 weapons. Slashers are neutral to toxic damage and are significantly resistant to piercing, microwave and explosive damage types. Slashers resist to every type of ballistic weaponry but most notably weak against SMGs and are resistant to handguns and shotguns. Slashers are extremely vulnerable against Firebug's Caulk n' Burn and heavy (blunt) attacks of Berserker's Crovel Survival Tool. Slashers are neutral to certain starting weapons and are notably vulnerable against default 9mm Pistol and Field Medic's HMTech-101 Pistol. Slashers have only one weak spot, which is the head. Although the damage multiplier is miserable. Primary: 2-hit clawing attack, can be done while moving. Primary + Sprint: 5-hit combo slashing attack while moving forward. Secondary: Hops forward a short distance then slashes with both arms. Secondary + Sprint: Leaps forward a longer distance then slashes with both arms. Jump button: High Jump. Sprinting can increase the speed and height of the Slasher's jump. Bash: Combat Dodge Roll, has no cooldown. Heavy attack. Damage - 15. Maximum hit range - 1.72m. Vs doors - x5 more. Cooldown - 1s. Light attack. Damage - 15. Maximum hit range - 1.72m. Vs doors - x5 more. Cooldown - 0.25s. Heavy attack (running / jump attack) - x1.5. Heavy attack (walking / stationary) - x2.5. Light attack (running) - x0.4 (5 hits per attack). Light attack (walking / stationary) - x0.4 (2 hits per attack). Upon exceeding walk speed by 10% Slasher can do bump damage to players. Slasher resistant to ZED Time by 75%. Jump cooldown - 1s. JumpZ - 1250. Roll cooldown - 0.2s. Player-controlled Slashers (along the Alpha Clots and Crawlers) start spawning at the first wave of the normal versus game.